Bobby Messano is such an underrated guitarist, he doesn´t get the same attention as Neal Schon, Randy Rhoads, Jimmy Page or Gary Moore. But he sure is worth it, this guy has played with the best and also recorded one of the best hard rock riffs in the history with Starz 1978 anthem "Coliseum Rock". Bobby has played on AOR classics like Joe Lynn Turner´s "Rescue you", Glen Burtnick´s "Talkin in code" and Lou Gramm´s "Long hard look". He´s been a member of Starz, Tycoon and Frankie and the Knockouts and toured with artists like Steve Winwood and Robin Beck. His first solo album "Messano" from 1989 is a magnificent AOR album and in 1997, the 2nd album "Dominion roads" was released but this time his fans could hear a new side of Bobby´s songwriting and guitar playing. Just like Gary Moore, Bobby went from melodic rock to blues and how he did it. 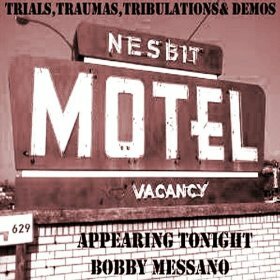 The 2003 album "Holding ground" was Grammy nominated for Best Contemporary Blues Album, and 6 years later we find Bobby releasing another fine blues rock album with "Trials, traumas, tribulations and demos". Sure, the most demaning sound freak has something to say about the drum production which is the most obvious demo sounding instrument on this 10 track album. The guitars and vocals sound great though, Bobby´s six string work is out of this world and I find myself flying away in the sky to the lovely acoustic piece "Fireflies". The album opens with the Eric Clapton-like "Lonely Ramona" that could´ve been featured on Clapton´s Journeyman album from 1989. Songs like "No soul city" and "Rain" bring thoughts to Steve Ray Vaughan and Joe Bonamassa, great and groovy songs indeed. I don´t own many blues albums but I sure as hell am proud over this one in my collection.